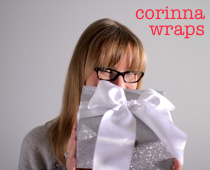 It’s that time of year again — Wedding Month on the Corinna Wraps blog! Throughout June, in addition to all the regular blog posts, I will also be sharing wedding-themed gift wrapping ideas, from products to DIY projects to inspirational ideas. If you have a wedding to attend this summer, this is where you’ll find pretty ideas on how to wrap your gift for the special couple. A bride yourself? (Congratulations!) I’ll also have some ideas for wedding favours if that’s still on your bridal to-do list. + Giving cash? Here’s how to dress up the envelope with lace. + For the couple who wants to make a charitable donation in lieu of giving thank you favours, here’s a nice way to let your guests know of your generosity.